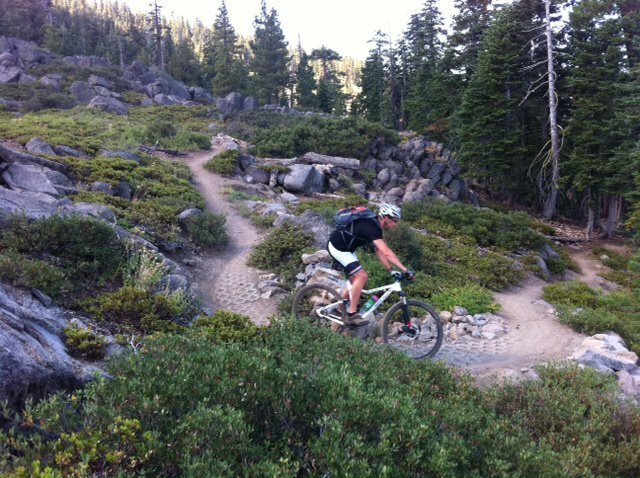 Mountain biking is a sport that can involve some speed; especially while on a downhill descent. Often we reach for the brakes slowing into those turns, and sometimes we find ourselves falling over, or just biffing it. Why does this happen? Lack of speed. Getting out of our comfort zone can be no fun, fearful, yet exhilarating. Here are a few tips to use speed as your friend, to help push your personal envelope and become a more confident rider. Ride a downhill section you have ridden before and note where you apply the brakes into that coming corner. The next time, wait a few second longer. Remember, speed is your friend. The wheels act as a gyroscope and want to stay upright. The faster those wheels spin the more rigid they become. The only way to accomplish this effect is with speed. Start this new maneuver gradually, and practice, practice, practice. Soon you will be taking those corners leaving friends in awe. Hold on to those handle bars! We all put a finger or two on each brake lever, right? Well, instead of placing your fingers on the lever, wrap all five around the bars. This will also give you a more secure grip. I know, this can be intimidating, but trust me, when it comes time to brake you will know where the lever is located. Don’t forget to keep that head up and look down the trail. Going faster is not something I recommend doing overnight. Ease into the feeling and gradually enhance those skills. Before you know it, you will be mountain biking faster and ready for any trail.